I love colourful ceramics and beautiful plants, and Phil loves fishing and gold fossicking and we both love cooking meals for the family,” Susie explains. 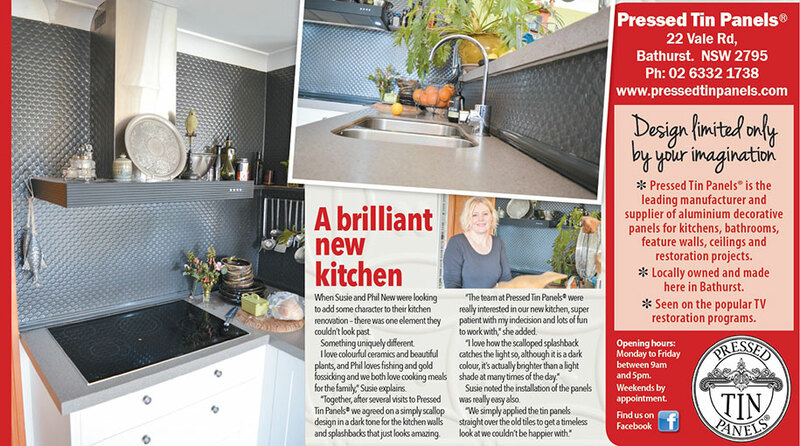 “Together, after several visits to Pressed Tin Panels® we agreed on a simple Scallop design in a dark tone for the kitchen walls and splashbacks, that just looks amazing. “The team at Pressed Tin Panels® were really interested in our new kitchen, super patient with my indecision and lots of fun to work with,” she added. Susie noted the installation of the panels was really easy also. Suzie’s kitchen features the ‘Scallop’ pattern powder coated in Dulux ‘Monument’.